First, let's talk about the weakest part of this film - in the beginning, the movie stumbles with its exposure and buildup. The main character Gray, an anti-technology car mechanic living in a futuristic near future, seems like a fish out of the water, but not in any intended way. Sure, the plot is clearly going to an ominous place but it appears to be taking its sweet time to get there in the first 20 minutes. The screen time for this part of the story feels somehow wasted and there is no meaningful connection neither between Gray and his wife Asha, nor between him and the life he�s living. But, with the intro into the story ending and the actual plot beginning, the movie switches gears. The biggest improvement at that point is the introduction of STEM, a self-conscious chip that bridges Gray�s damaged spinal cord and turns him into a flesh-based robot. STEM is a combination of KITT from Knight Rider and HAL 9000 and it quickly transforms the film into a brilliant action movie. 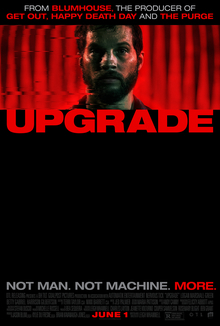 With some exceptional cinematography from the director Leigh Whannell and smart and funny script (which is miles away from the awkward and sloppy opening), Upgrade is sure among the top action films of the year so far.